Can Fish Oil Cause Unexplained Bruising? Does Fish Oil Help the Skin? Fish oil is a natural blood thinner that can lead slow your body's blood clotting time and increase the risk of unexplained bruising. Most people take the supplement for a variety of heart-health benefits. These include reducing cholesterol, blood pressure and the risk of heart attack or stroke. 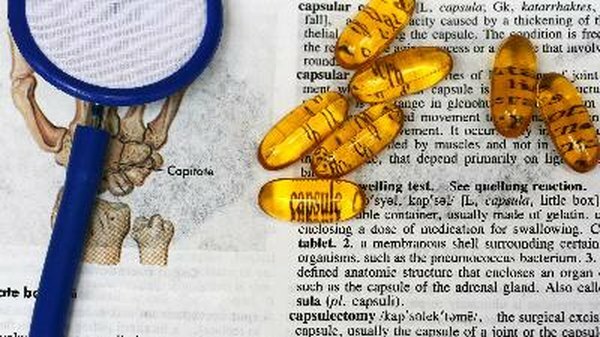 The supplement is sold over-the-counter and easily accessible; it is not regulated by the U.S. Food and Drug Administration. A variety of complications can occur if fish oil is taken improperly. Discuss taking fish oil with your health care provider. Fish oil may cause unexplained bruises on your skin, however not everyone will experience this. The condition is more common if you are taking anticoagulant medications or suffer from blood disorders such as anemia. Medications that might increase the risk of bruising include over-the-counter aspirin as well as prescription drugs such as warfarin and heparin. Bruises are a result of bleeding in the soft tissue underneath the skin. Fish oil is a natural blood thinner. Your blood may not clot as fast when taking the supplement. Bruises, also known as hematomas, cause the skin to appear red, blue or even purple, indicating internal bleeding. Though not a medical emergency, it is important to monitor bruises and seek medical attention if the bruises increase or become painful. When a bruise appears, you may be able to accelerate healing time by following basic treatment options. Still, if you are taking fish oil supplements additional bruises may appear. MayoClinic.com advises elevating the area and applying ice for one to two days to decrease bleeding. The clinic also suggests resting the area as much as possible. According to the University of Florida, compression stockings may decrease bruising on your legs. Medical supply stores commonly sell these therapeutic stockings over-the-counter. You may also notice additional bleeding when taking fish oil supplements. Bleeding from the nose is common. Seek medical attention, if you see bleeding in your gums, eyes, urine or other areas. Fish oil can also cause you to suffer from increased belching, burps, nausea and diarrhea. A severe, but rare, reaction is a hemorrhagic stroke. Taking large amounts of fish oil may cause blood vessels in the brain to burst, leading to bleeding. Increased confusion, dizziness or slurred speech are signs a person has suffered a stroke and emergency medical attention is necessary. What Is Flax Oil Good For? Can Exercise Cause Shallow Breathing?